As far as other daggers being more or less impressive, that kind of comes down to both modern and period taste. With more use of organics in the la tene cultures they don't always stand out as much as others might. 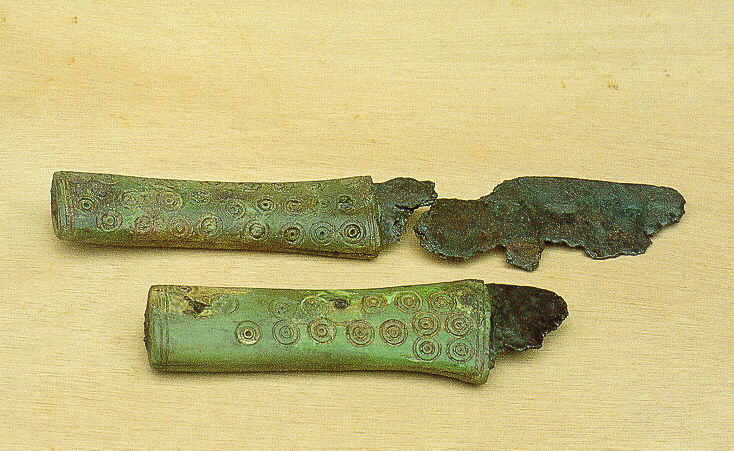 One of my personal favorite la tene daggers is the one found in the thames with the hilt of small connected rings, it is on display in the British museum so there should be pics of it around. Many of the anthros are just daggers though, even the largers ones would fall somewhere between sword and dagger size. The Iberian daggers can be decorated up pretty fancy and are up there in complexity as far as construction. Jim 'Atar' Hrisoulas actually had several go rounds with various customers over the years that argued his pieces couldn't *possibly* be hand forged, "...they are all too clean and consistent". Granted, Jim does use grinding belts for the finishes, but these are merely faster versions than the poor shmucks leaning over a water driven wheel. 90% of the shaping happens hot, and he's merely removing the scale , adjusting any "wobbles" along the edge, adding the choil, radiusing the shoulder of the tang, and providing the polish. In the meantime I have found "more" Celtic La Tene knifes that appear to be more like fithing knifes. This men wouldn't also have bin buried in a rich grave with grave goods and therefore nowadays would not be found. See for your self and tell my what you think. I think it would be nice to see more of this stuff and maybe a replica somewhere.. It has taken a bit to get back to this topic, but I finally sit down and go through my thoughts and try to type them out. The first weapon pictured there is a pretty interesting style that I've had some thoughts about for awhile now. Hope to pick one up if I can get the chance from ebay for a study piece, they are coming fairly regularly from the Balkan area. There may be regional names for these, but I have yet to find a name for this specific type. They seem to be more commonly Thracian in origin the best I can tell, however with the intermixing of goods it can get difficult to classify graves as specifically celtic or thracian in these areas. Most of the time they seem to feature the "T" type of back and lack the double curve along the cutting edge. These two characteristics pretty much separate them from the falcata. They share a bit more in common with the machaira in the "T" type of back, but still lack the double curve along the cutting edge. We also see this with the rhomphia as well. So it is in the family, but I think a specific type adapted most likely by the thracians. Also seems to make since that this might also be somewhat of the forerunner of the dacian Falx we start seeing a bit later. As far as the La Tene knives go, I still think it is very hard to tell the intended function of these. All we really have to go on in many cases is their association with other grave goods like Nate pointed out. The one thing that holds me back somewhat on these being carried either on the battlefield or even more of an everyday basis is that I would image that we would have more sheaths or scabbards for them than we really do. We do have some, but for the most part I don't think they are really even finding too much that would even indicate a simple leather sheath with these. There may be more found then I realized, but they just seem to be more around the home/work area items. First of all: Seesons greetings to all, and I do hope every body "survived" Christmas without gaining to much extra weight. I resently discovered this archeological auction/shop/store like site with some Celtic knifes that I wanted to ad to this thread. They do look a bid diffent then what I have seen before, these appear pretty slim. I would have to say buyer beware. StormBroek sells regularly on ebay, but I don't tend to pay much attention to an auction after I see the name. They sell some nice looking antiques, but not all seem to be as dated. 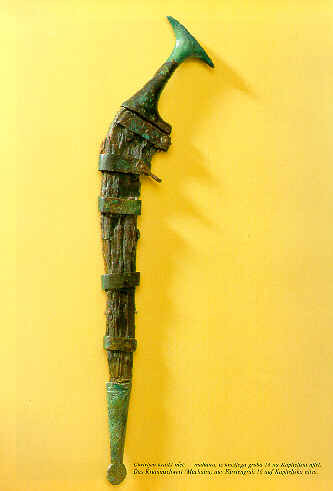 Some spears sold as celtic featured a square median ridge, something that I have only ever seen possitively identified on antique african spears of a much much later date. That is just one example of some of the questionable auctions I have noticed in the last couple years from them. The knives listed don't honestly look anything like the celtic la tene stuff, so it would take a some very good solid research before I would consider it safe to say they are such. Hm I am not a buyer... Only someone looking for more info upon his aera of interrest. But hey, whom can you trust those days..? Again Happy New Year to everyone!! The last knife/short sword you posted, the krooked one from Slovenija, is of a type that long have had a special interest to me. I always thought those were of Italian type (but an area of use including the balkans seems very natural, of course). Do you, or any one else know more about that particular type? I have some (not too detailed) copies of other blades of this type (can´t post them, sorry. My scanner is not in the right mood...). 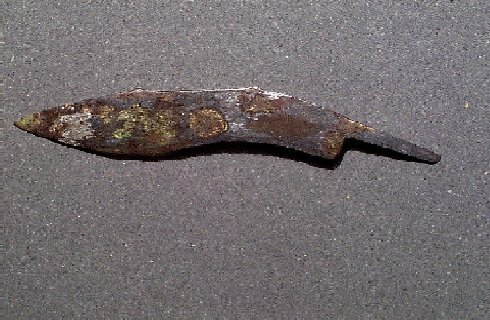 They are of Etruscan contex and look a bit like very drawn out and narrow Kukri knives. Cross section is a sturdy triangular wedge (makes for a good strong point as well...). One is about 55-60 cm in the blade, most seem to have been shorter (?). I have long entertained thoughts of making such a short sword, but never got round to actually do it (...story of my life). The one you posted Jeroen seems to have an all bronze hilt. Interesting! Nope, I just got to learn about it first while I was browsing through the Tomba website. It's a gorgeous piece, especially with the complete scabbard and bronze hilt. 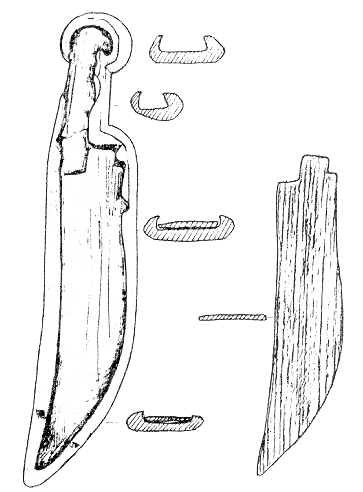 I believe I recall having seen similar shaped blades in a diagram Kirk (?) once posted of the development from urnfield knife to falcata. Nate something you might want to consider on the finish of these knives. Since they were more than likely utility knives used for daily chores, eating, cutting rope, skinning animals the finish would not necessarily be as the same standards as a sword for instance. However I agree that they would have probably been finished to a higher degree than the repro shown. I´m sitting here at one of my projects: The reconstruction of an (broadbladed) hallstatt dagger. 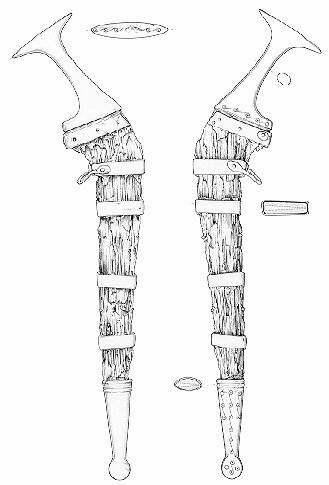 I´ve seen enough originals of hallstatt weapons - some in particularly good preservation. 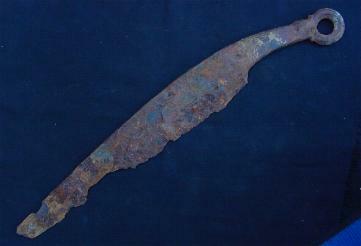 The sword- or daggerblades, the lances and spears - all was high grade grinded and polished (i guess sometimes near mirror-like). Rough surfaces boost the danger for rust! - The dagger was the sign of the free high class member of the westhallstatt society - in easthallstatt region the axe. - Only a little group is usable as weapon (some construction is very...fragile)! - No one looks like the other - but in the graves of Hallstatt are some pieces of the same artisan. My first reconstruction of an organic hilted (elmtree, antler) hallstatt dagger (typical for south germany/ north switzerland). That is a trully awesome dagger. What are the stats / dimensions? plus, would this have a been in the line from which the pugio emerged? 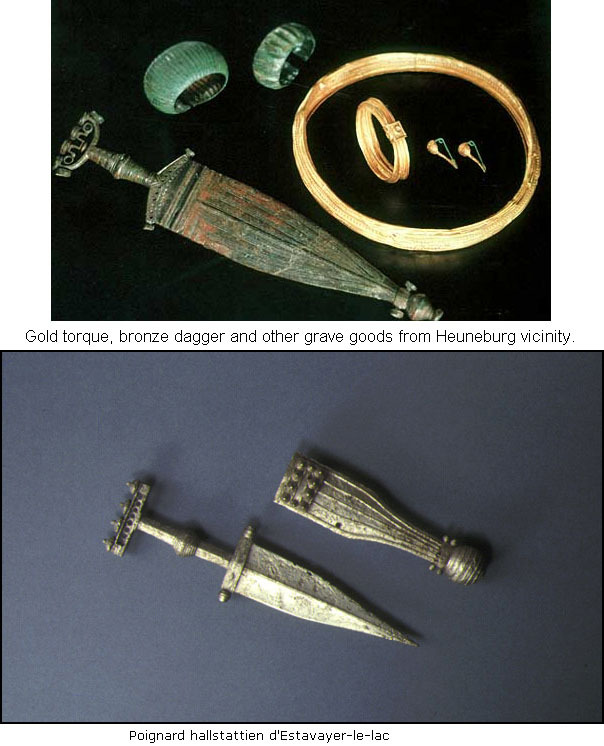 The daggers of this hallstatt zone was inspired by celtiberian daggers (and also trading goods from there). But between them and the roman pugio are over 350 years i guess (i´m not familiar with roman weapon history) with an break in that design! Is this a replica of any particular existing dagger? If so have you got a pic of the original? or perhaps on the ones in the pic attached? Nope - it´s a free reco, but bloody hard in style of the westhallstatt culture. Every hallstatt dagger was unique - also my own!